Krista, from Telkwa, was on the lake with her family. Her small daughter had never stood on ‘frozen water’, so out to Round Lake they came to try that new experience. Jim brought his small daughter, Hannah, so they could skate on the rink by the hall. With his quad, Tom was pulling 4 kids on a saucer across the smooth surface. Mary, Stuart and Dina went twice around the lake on cross-country skis. 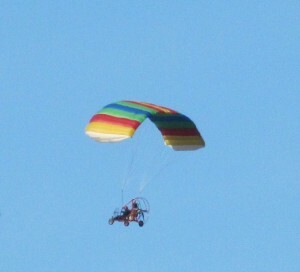 And John had driven from Houston so he could launch his rainbow-colored powered parachute up into the blue skies. So many of us enjoying the sun, brisk air, winter vistas and company of others, in so many different ways! We certainly appreciate all the feedback that we get about community events at Round Lake Hall. The dinners and coffee houses have been outstanding and even though New Year’s may have been a bit “laid back”, it was still a congenial atmosphere and kudos again to Al and Evelyn from Quick Eats for such an outstanding meal! In January if you stop by the hall, you will see alot of quilting being done by Heather and her friends. We have scheduled a “tech” potluck and practice where we hope to familiarize ourselves with more of the items we have for rent such as the proxima and sound system. Details are on the Round Lake calendar. You won’t want to miss the Coffee House on February 16th…again details on the calendar. There is a skating rink on the lake by the hall that we hope will survive the upcoming thaw. A shovel is kept handy to those willing to do a bit of excercise! Happy winter! Picture this…an almost 100 year old cozy community hall…..an authentic East Indian buffet…great music that you can’t resist dancing too….all this with your family and friends surrounding you. If you want to be part of this picture, get your tickets early for our New Year’s Event. Check out our calendar and click on December 31st for all the details! Round Lake Hall was the venue for a very successful dinner and dance last Saturday. An East Indian buffet style dinner was served up by Al and Evelyn. Tickets were sold out almost a week before the event. The hall was rockin’ all night with music provided by “Eric the Quick” and a good time was had by all! Many thanks to all the volunteers. The center of our community, Round Lake Hall, has been bustling with activity over the winter season of 2011 – 2012. The return of coffee houses enhanced by delicious dinners has been the “talk of the town!” Young ones are making new memories as they navigate the called dances and stomp to the tune of fiddles at the family dances. The hall continues to be a sought after place by prospective wedding couples. One can see one of the matriarchs of the hall, Nan Bourgon, nodding her head and smiling as this historic hall continues to serve the community. The Bulkley Valley Recreation site that has paths winding its way down to the Bulkley River has also been a very successful endeavour. All the hard work of planning, mapping and clearing trail is worth it when one sees the many entries in the guest book that is kept in the chalet. It is community volunteer help that continues to make our area such a great place to live and a big thank you to all who help in small and large ways. The Ministry of Transportation and Infrastructure (MOTI) continues with engineering work for the possible replacement of Quick Bridge, 35 km E of Smithers. The replacement decision is based on the age of the existing timber structure as well as the increasing load bearing restrictions (e.g. the structure may not support the weight of maintenance equipment and may limit the ability to provide maintenance services according to Ministry specifications). MOTI is in the design process creating a shelf ready project so construction can take place when funding becomes available. After a meeting with the local community at the Round Lake Hall in October 2010 some concerns were raised about the appearance of the proposed replacement structure. The Ministry has taken these concerns into consideration. A new structure would use the current alignment and potentially use the existing piers, limiting the disruption to the Bulkley River and surrounding lands. The ministry is working to ensure the community continues to have a safe and reliable bridge across the Bulkley River. The Ministry appreciates any input and comments. Questions can be sent by e-mail to the District Manager: Carl.Lutz@gov.bc.ca or by mail to the Ministry of Transportation and Infrastructure, Bag 5000, Smithers, B.C. V0J 2N0. The Quick Bridge was constructed in 1921 and is a wooden Howe Truss structure. The ministry has maintained the structure on a continual basis with signification repairs in the 1990’s and 2004. However, there is still an 8 tonne load restriction on the bridge. In 2008, the ministry hired Dean Barlow with Allnorth Engineering to assess the condition of the structure. He is a leading provincial expert on Howe Trusses and recently completed the innovative removal of a similar structure on the Adams River near Salmon Arm. His assessment recommended approximately $300,000 in repairs in addition to identifying concerns with the bottom chord of the bridge which is a major structural component of the bridge. There is extensive rot in the wood that makes up the bottom chord. At one point, these types of bridges were relatively common throughout the province, but the ministry has been working to replace these aging structures with new reliable structures. Based on the condition assessment of the Quick Bridge, the ministry has undertaken engineering work to identify options for this bridge. Replacement of the bottom chord is the only option to maintain the structural integrity. Unfortunately, this is an expensive and complicated repair. In order to do this work, piles must be driven across the river to support the entire bridge structure. A conservative estimate is over 80 piles. The bridge would then have to be jacked up from these piles and the chords could be replaced. This is a complicated process and it has some significant environmental impacts with the extensive pile driving. The end product is still an old wooden structure that will continue to require ongoing maintenance of the wood bridge components. The ministry attempted a similar repair on the Chehalis Bridge in southern B.C. This structure was 180’ in length and the costs to date are over $1,500,000. This bridge will likely still require replacement in about 10 years. Based on this experience, the 300’ Quick Bridge would likely be in the neighbourhood of $2,500,000 plus the $300,000 worth of repairs recommended by Dean Barlow. With all other costs (i.e. engineering), the repair of the Quick Bridge would be over $3,000,000. The ministry has looked at options for replacement and is still working on detailed engineering assessments. At this time, the preferred option is to remove the Quick Bridge and replace it with a steel/concrete single lane structure. This structure would use the existing bridge approach and piers. The current estimate for this replacement is approximately $1,500,000. This is a savings of over $1,500,000 which allows the ministry to invest these funds to improve other structures within the district. The new bridge would have an increased load rating. However, there are constraints with the bridge approaches and the Quick Station Road with regards to load capacity. The ministry would likely continue to restrict the bridge to levels below those necessary for loaded logging trucks. This would minimize changes to the traffic type and volume through the community. These details will be finalized and presented to the community prior to any decisions regarding the project. The final decision is not made and the ministry is working to ensure that the community continues to have a reliable and safe crossing across the Bulkley River. This is a chance to replace the structure as a proactive measure and to integrate local community input into the project. We appreciate your input and comments can be sent by e-mail to Mike.Lorimer@gov.bc.ca or by mail to the Ministry of Transportation and Infrastructure, Bag 5000, Smithers, B.C. V0J 2N0.